I walked into the church for vigil Mass this weekend to see the Advent wreath at the front of the sanctuary. Seeing the four thick glass cylinders with one pink and three purple candles, the priest in his penitential purple robes, the low light in the church from the early winter sunset outside, I had an immediate visceral reaction of knowing where I was in time. It was one of the first times I’ve really felt the rhythm of the liturgical year. Growing up in an atheist family, the concept of a liturgical year couldn’t have been more foreign to me. We did celebrate Thanksgiving and Christmas (as a secular holiday, of course), and the changes of the holiday season did provide a certain comforting rhythm to the year, but there was always the underlying sense that it was man-made, optional, and that the cheer of the season depended largely on a family’s circumstances that particular year. Probably the closest thing I ever experienced to the liturgical year was simply the change in seasons, but even that was a surprisingly weak structure. After all, as blogger Darwin recently pointed out, celebrating feasts of bountiful harvests or the arrival of fair weather is nothing more than a symbolic gesture now that we have supermarkets that overflow with a surplus of every variety of food every day of the year. Thanks to air conditioners and heaters, winters and summers no longer impact life on anything other than a surface level. And the rhythm of the seasons can fluctuate drastically depending on where you live; the arrival of Fall when my family lived in Bismarck, North Dakota was a completely different experience than when we lived in Phoenix, Arizona. It wasn’t until I began exploring Christianity that I realized how much I craved some sort of kind of anchor for my years, and for life in general. Now that I’ve been going to church for over a couple of years, I’m starting to internalize the ebb and flow of the liturgical year. The sights and sounds and smells of the church Saturday night immediately brought me back to the dark vigil Mass services of this time last year, and my whole body knew what season it was, and what was coming next; I knew without even having to think about it that we were entering a time of penance, reflection, and preparation that would be followed by a season of celebration and feasting. I used to find myself surprised at how natural this felt. You’d think that observing the customs of the liturgical year would be something so foreign to me that it would be difficult to get into. Yet as the long season of Ordinary Time draws to a close and the Advent season begins, I see why it feels so right. First of all, it offers an age-old structure for life that was lost when modern technology allowed us to subvert seasonal changes in weather. But, most importantly, the liturgical seasons order our lives toward God, whom we all crave more deeply than anything else, whether we realize it or not. Looking back, my life as an atheist seemed so adrift not just because there was no real rhythm to my years, but because it was anchored on something other than God. The liturgical year has felt so natural and has brought with it a deep comfort and peace because, in a way, following its practices is what I was created to do; I was created to know, love and serve God, and the rhythms of the Church seasons help me do that. The candles at Advent, the ashes at Lent, the great spreads of food at Christmas and Easter feasts all have meaning that goes deeper than anything in this world, pointing to the truths of who God is and who we are in relationship to him. They provide the most steady, solid anchor that our lives could possibly have, because they are anchored to the only real rock, the only immutable thing that is; they are all anchored on God. What a great post! As a life-long Catholic, I took for granted the natural rhythms created by the Liturgical year. Thanks for putting into words what I’ve loved for so many years. 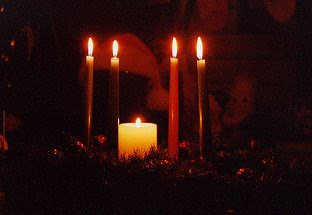 A holy advent to you! 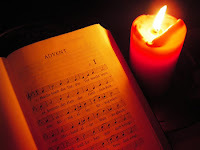 I’m a cradle Catholic, but it wasn’t until I was in college that I started to get that visceral reaction to seeing the purple in church on the first Sundays of Advent and Lent. It’s such an exciting time, but I particularly love that it’s the kind of exciting that counteract the excitement and frenzy that’s going on in the commercial sector right now. When seeing those purple vestments makes you look forward to Christmas, you know you’re looking forward to it for the right reasons. Having moved from the Episcopal church to a non-denominational Bible church, I have lost that feeling of “the right time” for the seasons. I am implementing a church season of sorts for our kids, though. We are doing the Jesse Advent Tree to “lead” them into Christmas, and I’ll introduce Lenten principles when they’re older. Hubby and I also want them to feel comfortable in any church, so they’ll have opportunities to learn liturgical principles. I love that my husband, a former Baptist, is excited about the Advent wreath. Moving through Advent readies us for Christmas. Loved your post on this topic. It’s funny you should touch on this topic. I’ve been reflecting on how much I’ve grown to love life in rural America. Having grown up in a very suburban area I never knew which directions was North, South, East or West. We couldn’t see the sun rise or set over the houses around us. This weekend as I noticed the farmers hustling to bring in the fall corn I knew instantly that they were working so hard on Thanksgiving weekend to beat a winter storm. I didn’t need the weather channel to know we would have snow by Monday. As evening gathers around my home, and winter closes in I can glance out my window and see the sun setting low on the Southern horizon so far away from the Northern position it rests during the long days of summer. We have animals to care for and their needs are distinctly different in the winter and our tasks are much harder when it’s cold. All of these things need to be accommodated in our day in day out lives, and it grounds us to the land in a very different way. I love rural life if for no other reason than my son knows that live chickens aren’t shaped like nuggets, and real people grow the food we eat! I’ve been curious about the idea of atheists celebrating Christmas. My atheist brother still gives/receives Christmas presents. He grew up Catholic, so I think it’s out of habit. Would you mind sharing how you and your family celebrated Christmas in a secular way? What did you parents tell you about Christmas when you were little? Also, that’s way cool that you lived in Bismarck, ND! That’s where I’m from! Yes, sights and sounds and memories flow. No matter how much changes, there is a sense of belonging to those. As someone brought up in an atheist household and still struggling with the idea of God, reading this makes me feel a little sorrowful. It must be nice to have such a strong visceral sense of time and place, fitting into this huge cosmic progression. My daughter and I are sick right now probably with salmonella poisoning so we were unfortunately unable to attend Mass yesterday. I have really been looking forward to advent but it isn’t starting the way I envisioned it. This start for advent doesn’t feel right. I have recently realized that it is my job as wife, mother (and homemaker) to Do the things that help us feel and see the holidays and thus liturgical seasons making them “real” or rather to come alive to us. Without the sights, smells, sounds and tastes it just doesn’t seem real. This is as true for holidays from a secular perspective as it is for litugical cycles and Holy days. I hope this makes sense. It does in my head but I’m not sure I conveyed it well as I am trying to leave out examples for an attempt at brevity. Wonderful post. I missed Mass this weekend and your words painted a perfect picture for me. I grew up in a fundamentalist home where Christmas was not celebrated as the birth of Jesus. We celebrated Christmas as a secular, family holiday. I have very warm memories of family, food, togetherness and simple gifts from my frugal family. Still, I yearned for something more and somehow knew my Catholic friends had it. Looking back as I journey toward the Catholic church, I’ve remembered that childhood deep longing for some kind of ritual, traditions, and liturgy that was missing. I felt it again a few years ago when we attended the baptism and party afterward for the baby of dear friends. This friend really opened my eyes and started my investigation into Catholicism. My prayer is that soon I will be looking at all this from the “inside” of the church. Advent is totally new to me. I heard about it for the first time a couple weeks ago. For some reason I’m really excited about it. Jennifer, you always say what I feel, but I am so unable to express. Thank you for your insight into the meaning of the season of Advent, of which so many are completely unaware in the frenzy of Christmas. I am also a convert to Catholicism, and the liturgical year is such a comforting marking of time, providing meaning at each moment. Thanks again for your thoughts. You are a talented writer and it clearly shows. I am a cradle Catholic also. I didnt appreciate my faith until I had children of my own. Now I get it. And now I also live it. The liturgy is the place that I feel the most at home. I have recently moved from a country town to a big city. I am a foreigner in my own neighbourhood. For the last few weeks I have cried during the liturgy because I have felt at home. This last sunday I was visiting my parents in law and attedned their modern liturgical worship. It didn’t touch my heart at all and I felt nothing. When we first knew we were moving I was reading Psalm 90. “From generation to generation, you Lord have been our home.” I am only at home in the midst of God blessing me in his most holy time. Thanks for your words. It’s nice to be understood from the other side of the world. The words “I was created to know, love and serve God” make me very sad to read. If the god you believe in did in fact create you, and created you for the reason alone of serving him, then it does not mean that you should do so. Any god who created beings for the sole purpose of serving him sounds like a pathetic and sad creature. If this creature was in fact real, as you believe is true, then I would not serve it, but perhaps I would befriend it. This creature however, does not even deserve that. This creature demands you serve him, at the penalty of eternal damnation. There is no action more disgusting and cruel, and no being more evil than one who would do such. Follow this god out of fear, and I might feel for you, but follow this god righteously, and you are in my opinion no better, in fact far worse, than the soldiers who sat back and watched as Jews were enslaved and massacred in the Holocaust. Captivated by the beauty of holiness. Beautiful thoughts, expressed well. Bravo. Um, wootloops, way to violate Dodd’s Corollary to Godwin’s Law (http://tinyurl.com/5q9guh). Not only do you automatically lose by virtue of Nazi-comparison, this particular argument doesn’t even make sense. And just what horror and mass murder and massacre and evil and ungodliness is Jennifer guilty of being complicit in? The Holocaust is not some distant fact of history for me. I’ve touched the tattooed numbers on the arms of those dear to me. My own grandparents — who you would claim were far worse than the gestapo who threatened them — came under attack, their very lives threatened, because they believed so strongly in serving the God they loved. I am not a Roman Catholic. In my faith tradition, we sometimes repeat what we believe to be a simple explanation of our purpose: “to glorify God and enjoy Him forever”. I do not believe that finding our enjoyment, our purpose, our service, our love, the core of our being, in the One Who made us and loves us and gave His Son for us — I do not believe that makes us worse than those guilty of the Holocaust. Especially since there are those of us who believe just like me who are honored and recognized in Israel for the sacrifices they made on behalf of the Jews. Why? Because we believe they are specially chosen by the very God we serve. Please…do you have any idea, Wootloops, how intolerant and illogical your attack here is? Um…..what exactly does following God out of a sense of rightness have to do with German Soldiers and Jews in the Holocaust? I would have to say I may agree with you if I were to consider “I was created to know, love and serve God”, as a stand alone statement. However, God’s relationship with man becomes clearer in the person of Jesus Christ, and God’s unlimited willingness to serve mankind becomes clearer when one considers Jesus’ suffering on our behalf. The whole God thing is by no means a one way street, but it’s not for everyone. It does involve service! I believe it was John C. Wright who stated that the process of coming to know God is similar to the process of being in love. For those who have experienced it no explanation is necessary, for those who have not none is possible. Wootloops – She serves a God of love. I think your antipathy towards this idea may stem from a misunderstanding on your part of the idea of “eternal damnation.” Damnation is not a punishment that God inflicts on us. Damnation is a logical consequence of our distancing ourselves from God and love. Just like a room without a light becomes dark, our lives without God become damned and hopeless. The dark is not a punishment for the lightless room; it is merely a natural result of the lack of light. God created us to serve with him in the redemption of Creation. We are his eyes and hands to help the suffering, feed the hungry, clothe the naked. That’s hardly a sinister motive, is it? And he doesn’t require of us to do things that are wrong – murdering, stealing, etc. So the Nazi comparison really doesn’t hold. Your comment about knowing God being like being in love is interesting…I’ve moved through atheism, to agnosticism, to a sort of awkward theism – your comment made me see my current position as being rather like having an inexplicable crush on someone you know you shouldn’t like, don’t understand why you like ( but do anyway), and are trying to work up the courage to talk to. I don’t claim to understand exactly how man and God interact, or how I would fit into all this if I ever achieve more clarity on my feelings, but to an extent, I see what you mean about explanation and experience…I used to feel just as angry and frustrated as Wootloops. While I can understand where you’re coming from – I spent most of high school thinking that religious people should be sectioned – I don’t see the need for your anger. Jennifer isn’t expressing anything hateful or disgusting – she’s talking about having a sense of peace as a human being who feels she has a purpose and balance. The Nazi analogy seems a bit extraneous. I’m still trying to work out just what an awesome entity God might be – of course you can’t have an equal relationship between such a being and humans. But just because it can’t be equal doesn’t mean that God is some kind of cosmic dictator. Dictators don’t make ultimate sacrifices for their people. There are those who can explain things better to Wootloops than I possibly can (thank you, SC and Anne Marie), but a priest at RCIA gave us a simplistic explanation that resonated with me: God isn’t a pathetic creature who created a species of subservient humans because needs our adoration and love. He didn’t create us to worship him because it’s a good thing for Him, for His ego. He created us to know, love and serve Him because it’s a good thing for US. Our desire to know Him is one of the greatest gifts he gave us. As Jen (and many others) have remarked before, if God didn’t really exist, someone would have to make this up, because it’s true. Serving others strengthens us, makes us more compassionate, makes us plain better mothers and sisters and daughters and friends. You seem to have missed the other two words in that sentence that are important. They work as a natural progression one to the other and one is not exclusive or even possible without the other. First comes knowing. The more one knows about God, the more one loves God. Because to know God in truth is to love Him. Service is simply the natural result of the first two steps of knowing and loving. All true love requires service of some sort in it’s demonstration, whether it’s the mother waking up to get the baby for the 5th time that night or the spouse who does some form of work on the other’s behalf out of genuine love and regard. It is not a case, as you imagine, of a small and petty tyrant demanding that his will be done, but of a being so good that knowing Him and loving Him the natural response is that one is compelled to serve Him. And since service to God usually involves love of neighbor, to love and serve God is to love and serve each other. God does not wait for me, or you, to become good, to serve first or else eternal damnation. He has already accepted you, already redeemed you, already stands ready to take you into His arms and tell you you are loved as you are, welcome home. He wants not slaves, but sons and daughters. Service is what people who love each other do for each other. Jesus, God in the flesh, got on His knees and washed the dirty feet of His disciples, drying them on a towel worn ’round His waste. And so He set an example of loving service for us, not from a high and distant throne looking down on us, but on His knees, our dirty feet in His lap, making us clean. I pray you will find peace. was beautiful. I haven’t really felt this yet, I don’t think. Indeed, if I were trying to use the Holocaust analogy as some emotional appeal to prove that Christianity is wrong, it would be a fallacy. However, I am speaking strictly of morality. Emotional appeals are all we have, as they are the basis of morality. You all say that Jennifer is just loving God, just trying to be at peace, but alas, that is exactly what disgusts me the most. You discover that people are being eternally damned, are you are gleeful? And you follow this god? Are you kidding me? You may think of Hell in any way you wish, it changes nothing. You may say that we damn ourselves, but your god still creates the standards and allows it to happen. There is no greater evil than eternal damnation. There is no greater torture. All of you, by following your god with a sense of righteousness, are advocating this, approving of it. You all actually believe that people are damned for all of eternity. You believe this. This is reality for you. Do I really need to tell you how sick and wrong that is? Would you not say that the soldiers who followed Hitler with a sense of righteousness, in full knowledge of his Jewish slaughter, were not the best of people? Well I say to you, you are far worse than them. You are in full knowledge of something far far worse than systematic slaughter. How dare you ever say that the Holocaust was a terrible thing while you still follow the god you believe in. How can you sit there on Christmas day and celebrate, knowing full well that there are countless people suffering in Hell, people who will suffer for all of eternity? You should be sick to your stomach at the absolute bleakness of your existence. You should be crying on Christmas, not smiling. You should revolt against your god. But you don’t. You sit there gleefully and celebrate, awaiting your place in the Kingdom of God, at the price of all your morals. There is no amount of good you could ever do on this Earth which may erase the evil of following the Christian god. In the same way, it shouldn’t matter how much you think your god does for you, or how much you feel loved by him. Your god still damns people for all of eternity, and that should much more than enough for you to turn away from him, and demand that he put an end to such madness. If a god really does exist, and he is a loving god, then I should have nothing to fear in not following him. And if this god is malicious, threatens me with punishment for not following him, then I am doing the right thing in not following him. But alas, it’s all just my opinion in the end, as indeed any moral view expressed is, including God’s. And on being angry, that’s the whole point. I’m trying to argue a point of morality. It’s more effective to be emotional while arguing a subject based on emotion. I have known and loved this liturgical calendar my whole life, but it’s wonderful to hear your perspective on it, as a new Christian. It helps me think about it from a different angle, giving me a better understanding of why my being craves this liturgical rhythm. Don’t worry about working up courage to speak to God. Just imagine the most loving parent in the world cooing with a baby. The baby babbles and makes no sense, but the parent is actively engaged and lovin’ on the child despite the nonsensical babble. Even when the child screams, has a fit and yacks all over the parent, a good parent simply sooths the child, cleans them up and keeps on lovin’ on the child. You can start talking to God just like that. I think the foundational question is what are the underpinnings of the morality by which you are trying to argue your point? I disagree with your assertion that emotional appeals or opinion are the basis or morality. In fact, I would propose that questions of morality are very firmly grounded in the Truth. A Truth which is immutable and not in the least subjected to or influenced by any particular emotion. To say that if God exists and is loving we need not follow him is as absurd as suggesting to one’s spouse that since he/she loves us we need not concern ourselves with fidelity to the relationship. Finally, I would propose that joy in our salvation and horror at another’s damnation are not mutually exclusive positions. The underpinnings of my morality are likely to be of numerous sources. I only speak in terms of morality from the feelings I have. The morality of our societies only exist as a collective social construct. Objective morality cannot exist because the entirety of morality is a construct of the mind. Morality is the opinion of the individual, and this applies equally towards God. Him creating us, and the whole of our existence, does not mean that his particular views of morality are objectively true. You may align yourself with your god’s morals, and use them as a personal objective standard, but they are nonetheless not truly objective in reality. No moral claim is superior to another, and every action taken remains equally amoral. It may be a truth that your god exists, and that he holds a particular moral view, but that’s the only truth to be found. His moral opinion is not an objective truth because in the lone action of me differing on a moral issue, I am negating that. And even if all of the living creatures in all of existence had identical moral views, they all remain equally subjective because moral opinion is not real; it’s a construct. Your god being in a position of authority and power, does not make him any more moral than anyone else. It does not mean that everything he says is an objective truth. Hitler, and yes I’m using that analogy again, may say that the Jews are evil and that slaughtering them is a noble action, but does his position of power and authority make his moral opinion that the Jews are evil an objective truth to all those under his reign? Would you, under the rule of Hitler, accept his moral claim as objective? Well you better, or else he is going to slaughter you with the Jews. Sound familiar? Your god tells you that eternal damnation is moral, and that all those who are punished with it deserve it, and if you dare defy his claim, he will throw you down there with them. Why is God’s morality objective? Because he’s God? Why is Hitler’s morality objective? Because he’s the Fuhrer? Dare call Hitler an evil man, and he will gas you to death. Dare call God an evil god, and he will throw you in Hell. All I may try and do, all anyone may try and do, is try and appeal to the innate morals within people, granted to you by your evolution, your society, your growing up, your whatever. Luckily, we all seem to have similar morals once we get down deep, and strip away all of the nonsense. If we didn’t, we would not have survived this long. And regarding following God: I said that if a god exists, and this god is benevolent, then I should have nothing to fear in not following him. I didn’t say that I should not, or need not follow him; just that if I didn’t, then I should have nothing to fear. However if this god were malicious, then he would threaten me with punishment for not following him, as your god does. In this case, if I wished not to be a coward, then I should not follow this god, even at the pain of punishment. And finally, as a counter proposition to your proposition, I propose that you should have no joy in your salvation, but rather disgust in it, because you chose to follow a being who damns people for all of eternity. Perhaps I’m just grossly ignorant about the Bible and Christian theology, but I was under the impression that the actual Bible says very little about Hell, apart from stuff to the effect of “wailing and gnashing of teeth”, and that the whole huge-underground-cavern-of-fire-and-eternal-sadistic-torment thing was something that arose in later Christian tradition, and popularized by the likes of Dante and Milton? Perhaps my Christian friends are all just very liberal, but the impression that I’ve gained from them is that the torment of Hell is psychological/spiritual as a result of separation from God? But maybe I’ve got this completely wrong? You’ve raised some good issues. Flannery O’Connor said the easiest way to reject God is to believe He is not good. If God is not good, He is a cruel gamester. But I think the idea of a single God as an arbitrary and capricious autocrat is not truly Christian. You are obviously intelligent and inquiring. I recommend you read C.S. Lewis’ The Great Divorce. I love the part about being anchored on God. So true! SuburbanCorrespondent and others above have it right. We believe that God loves us unconditionally and completely, and yet we also believe that people *may* end up in Hell. Before condemning us as “evil” and worse as the Nazis, you should try a little harder to understand how those two facts can harmonize and be reconciled. You are either honestly or willfully misinterpreting basic Catholic belief. Simple examples: we are not “gleeful” at the prospect of people reaching Hell. We hope that we will reach Heaven; we do not passively “await our place” there. We do not believe that non-Catholics and non-Christians are necessarily condemned to Hell for not believing the Catholic understanding of God. And so forth. Your speeches are quite passionate, but your Hitler comparisons are the worst sort of straw-man argument and your reasoning is deeply flawed. Your assertion that “His moral opinion is not an objective truth because in the lone action of me differing on a moral issue, I am negating that”, for example, is specious logic. Nobody is objectively right because we have different opinions? Absurd. That may work for you, but you haven’t — and cannot — prove your assertion that morality is a merely human mental construct. Finally, to actively revolt against God, as you suggest, would be both futile and dangerous. It would gain you nothing in this life, except perhaps some misguided self-satisfaction at being “free”, and might condemn you in the next. God’s love and mercy are far beyond anything we can imagine, but he cannot and will not *force* anyone to accept his gifts. We can always choose to live apart from God, but the belief that that choice is in any way good or empowering is a delusion. I don’t mean to sound harsh, but your arguments are really nothing new. There are excellent counter-arguments and discussions available to study if you are really interested in getting at the Truth. You’ve rejected several people’s responses out of hand already, which doesn’t give me much hope that you’ll listen to this one either, but it’s up to you. Peace. Okay. First off, instead of using “Read C.S. Lewis” as your argument, maybe you should have one of your own. Because surely, if you were capable of understanding Lewis’s actual argument, you would be able to para-phrase it as your own argument. The fact that you can’t, leads me to believe that you can’t even understand his argument, let alone mine. I could say as well, that for every argument you bring up, there is a better, more “expert” counter-argument. This however, leads nowhere fast. Also, saying that you’ve heard the argument before, or that the argument is old, is not an argument either. I spend my Christmas volunteering at a charity. Then, I just eat bread at dinner, because I don’t want to eat a turkey, or any other priorly sentient creature unless I am starving and have to. That’s what I do on Christmas. I don’t have the guilt of following an evil god, I don’t have the guilt of taking the lives of sentient creatures, and I have less guilt for having luxury while there are people starving in the world. I don’t need to cry, but maybe you do. God is just a word. The being that you describe as god, does not gain any special objective authority through thinking he is a god. Your god, if he does so exist, is an extremely intelligent and powerful entity. That’s what he is. Changing his title does not change what he is. Me thinking God as a god, does not change how I think of God if I thought of him not as a god before. The god you believe in is described in your doctrine. It is what it is. It damns people to Hell; damns then for all of eternity without the capacity for pardon. Your omniscient and omnipotent god, who is necessitated by his described characteristics to have known every action every creature he created would ever take, before he had even created them, created these beings and then damned them for the actions he had already foreseen, when he could have created them so that they had not taken those actions. This god would surely fit the characteristics of a cruel gamester if you ask me. I don’t care if people who don’t believe in your god still might reach Heaven. That changes nothing. The fact that there is a Hell is what matters. If I believed in your god, all it would take is one person being damned to Hell, even if this person was a mass murdering psychopath, for me to turn away from him. The reason I use the Nazi comparisons is because Hitler and the Nazis are what most people can universally recognize as “evil”. You believe that your god is all loving and good, and so in order to try and persuade you otherwise, I am giving you examples of people who have done things similar to what you claim your god does, and yet you consider those actions evil and your god’s actions good. You consider everything your god says as objective truth because he is God. You don’t believe eternal damnation to be immoral because your god says that it is not. Well I ask you, what if your god was the same as Hitler? What if your god said it was a noble action to slaughter the Jews? Does it, because he says it is good, make it good? Or would you refuse him because you know, because your morals tell you through your emotions that such a thing is wrong? If you reject Hitler, he kills you. Where is the straw-man? Please, tell me. If anything, Hitler is not a harsh enough comparison. How can there be a correct answer to something based solely on subjective opinion? You cannot touch morals in reality. Your morals are in your mind, in your thoughts. God’s morals are in his. They are therefor subjective. There, I’ve proven it. Unless of course you are to say that God is the universe, and that we are in his thoughts, and therefor his morality is objective. But even if this were the case, my morals would be equally God’s morals as the morals he claims are his because I and my morals, are as much a part of his mind as the morals he claims are his are. And if you say that we are separate entities within his mind, then I am separate from God, and his morality is therefor not objective. God can say that to kill a man is wrong. I can say that that it is not wrong. How can you prove either of us right or wrong? Is God right because he is God? Because he has the highest authority and power? No, that’s proving nothing. All that does is impose a certain individual’s morality onto others through force. This is exactly the point. How can you say in the next sentence that “God’s love and mercy are beyond anything we can imagine” when he will damn you for all of eternity for disagreeing with him? Are you oblivious to your own words? You are telling me to try and understand how these two “facts” can be reconciled, and yet you cannot explain in your own words how it is so? Are you kidding me? Reconcile these two facts for me Matt, harmonize them, if it is the case that they can be. All you are doing in following this god is being a coward, and not standing up for what is right. Are your morals so expendable, so unimportant to you, that you will follow evil in order to save yourself? (And I say “evil” and “right” in the most subjective sense possible.) I surely hope not. There is nothing empowering about living apart from God, if he so exists. It’s a matter of morality. If I believed in your god, I would reject him; not to empower myself, but to stand up for what it right, to avoid aligning myself with an evil being who damn people for all of eternity.